The first week of 2012 was pleasant and cool in Bhubaneswar. An otherwise relaxed and passive town, this week Bhuvaneshwar looked abuzz with activities. There were banners and hoardings everywhere in the city about the 99th ISC (Indian Science Congress) being held at KIIT University. The roads were clean, and neat, certainly not as congested as Chennai roads. The traffic was more than usual, I was told. The Prime Minister had just come the previous day to inaugurate the 3 day event. The ex-President, Dr APJ Abdul Kalam had come the second day to address the young scientists. A host of Ministers, Mr Kapil Sibal and the like from the Central Government and Orissa (now called Odisha) State Government who had any relevance to Technology, Education, and Women’s welfare were there. The newspapers all over the country featured advertisements ushering visitors to Bhuvaneswar. The event manager was telling that some 15000 delegates were coming to Bhuvaneshwar and there just were not enough hotels to put them all up. The President of eWIT was invited to be on the Panel as a speaker as well as be the host of the panel on the second day of the event for a 2 hour program in the morning. It was such a privilege for us to accept this. 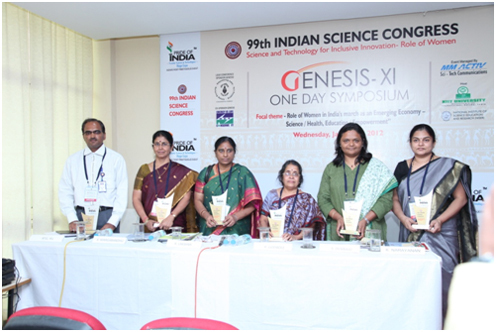 The Focal Theme for this 99th ISC was - “Science and Technology for Inclusive Innovation- Role of Women”. In fact, this is the first time that ISC has given women a focal point. To complement focal theme - "Role of Women in India's march as an Emerging Economy – Science / Health Education / Empowerment” was the theme on the second day. Our panel topic was on “WOMEN’S EMPOWERMENT – PROGRESS AND THE ROAD AHEAD”. As a representative of eWIT, Mrs Kalyani Narayanan, President of eWIT, spoke on the subject specific to women in IT/ITES industry. She emphasized that while there is opportunity in the IT/ITES industry that would empower women, the ecosystem has to be developed alongside the IT/ITES industry growth. The key components of the ecosystem were the educational system, the social and cultural framework, the women themselves, the family and the support system, and the government needed to undergo reforms and progress alongside the industry so that the women could take full advantage of this growing industry. Many other eminent female scientists, doctors, etc. representing Healthcare, Technology, R&D, Air Force, etc. were present sharing their thoughts and emphasizing the need for women to enter into these areas. For eWIT, it was certainly a great platform to let everyone know who we are and what we do for women in IT/ITES.